Collect notes, e-mails, and Web pages on your Mac, and search them instantly. EagleFiler makes managing your information easy. It lets you archive and search mail, Web pages, PDF files, word processing documents, images, and more. Use it to collect information from a variety of sources. Browse different types of files using a standard three-pane interface. Organize them into folders and annotate them with tags and notes, or leave everything in one folder and pin-point the information you need using the live search. 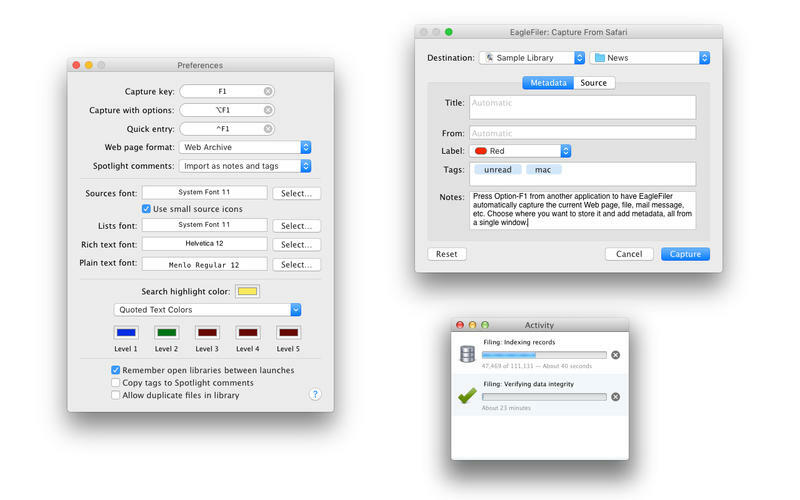 Since EagleFiler stores its library in Finder format, it works smoothly with your other favorite Mac applications. *   With a single keypress, import Web pages, mail messages, or any file on your Mac. *   EagleFiler stores them in an open format: regular files and folders that are fully accessible to your other applications. *   Optionally: encrypt the files, add tags, notes, color-coded labels, and other metadata. *   Browse by folder or by tag, or use the live search or smart folders to find the information you need (faster than Spotlight). *   View, edit, or create documents directly in EagleFiler's streamlined interface, or double-click to edit using another application. 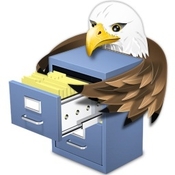 EagleFiler is a digital filing cabinet, a research assistant, and a snippet collector. You can use it to write a journal, track all the files for a project or job, save your favorite Web articles, store financial statements and receipts, run a paperless office, plan a trip, collect your course notes, archive your e-mail correspondence, search mailing list archives, research a purchase, remember recipes to cook or books to read, store scientific papers, gather legal case notes, or assemble a scrapbook. It's the most flexible tool on your Mac. 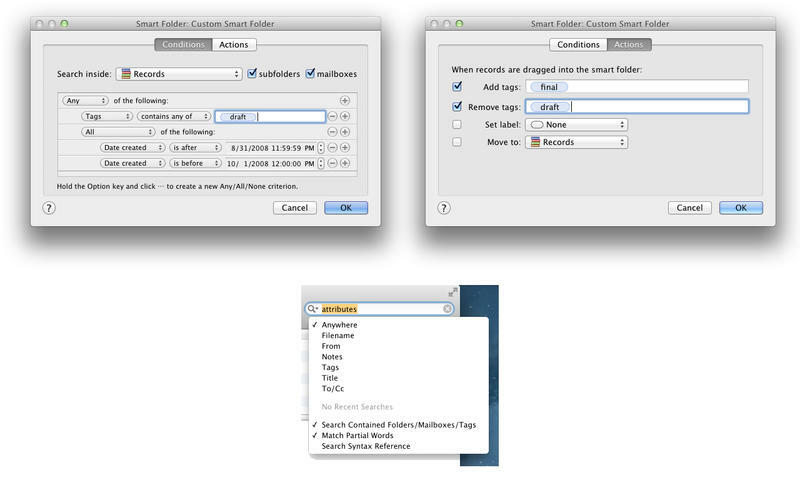 ● For consistency with Finder, the New Browser Window command now always makes a new window. As before, when you open a library EagleFiler follows the system preference to decide whether it should be tabbed, and you can use the + button in the tab bar or the New Tab command to make another tab for an existing window. ● The Command-Up Arrow and Command-Down Arrow keyboard shortcuts no longer change the selection in the records list when their corresponding menu commands (Enclosing Record and Contents of Record) are disabled. This is consistent with Finder and should help prevent getting lost when you reach the top or bottom of the hierarchy. ● When opening a record link, EagleFiler now deminimizes the window from the Dock, if necessary. ● When a file in a subfolder of the To Import folder is skipped because it’s a duplicate, it’s now moved to the same relative location in the Unable to Import folder instead of the top level. This should make it easier to figure out where it came from. ● Updated the Importing From iOS section of the manual. ● The Capture Not Supported window no longer shows the Show Drop Pad button if the Drop Pad window is already visible. ● EagleFiler no longer tries to import metadata files for Dropbox’s Selective Sync feature. ● Acorn 5.6.4 fixes a problem that could cause Acorn to quit if it was launched as a result of EagleFiler asking it to open a file. ● Improved the error reporting when moving files. ● Documentation and Help menu links to c-command.com now use https instead of http. ● Added the DeleteRecordsWithoutCommandKey esoteric preference, which prevents the Delete key from accidentally moving records to the trash when the Command key is not down. ● Worked around a bug in Preview that could cause an internal error when importing a PDF page via drag and drop. ● Partially worked around a bug in macOS 10.12 that could prevent some text from being properly indexed for searching. If this was affecting you, you’ll need to rebuild the indexes to see a change for existing records. ● Fixed a bug where typing Command-Delete in a text editor or text field could move the selected record to the trash instead of deleting text to the beginning of the line. ● Fixed a bug where an internal error could occur if you emptied the trash while EagleFiler was generating an icon preview. ● Fixed a regression where EagleFiler would sometimes show records list columns that had been hidden.